Range: The jungle carpet python (a sub-species of carpet python) occurs in the extreme northeastern Queensland, Australia. Other sub-species of Carpet pythons can be found throughout Australia and New Guinea, and northern New Zealand. Habitat: This snake can be found in dense-sub-tropical rainforests and into river basins towards the coast. Diet: Small rodents, marsupials, lizards, birds, and bats. Size: The average length is 6-8 feet, but large females can reach over 9 feet. Lifespan: The jungle carpet python can reach 15-20 years in the wild, 30 or more years in captivity. Daintree came to us in December 2011 at about 2.5 years of age. She is from the Staten Island Zoo in New York. She is named after a large wildlife preserve in Northern Queensland where the jungle carpet python can be found. Pythons and boas are in the same general group Boidae because they are very similar genetically. Both are more ancient snakes that have been around longer than other types like vipers and kingsnakes. Because they are ancient snakes, they have a vestigial back limb called a spur on either side of the cloaca (vent). This is a small bone coming off the spine with a claw at the end. Boas are mostly found in the “New World” of North and South America; pythons come from the “old-World” of Europe, Africa, Asia, Australia, and the south pacific. Pythons are the only snakes that have 2 full lungs; boas (like all other snakes) have a normal right lung. The left lung has become vestigial, or small and not used. Because carpet pythons are found over a large range with different habitats they vary in color. 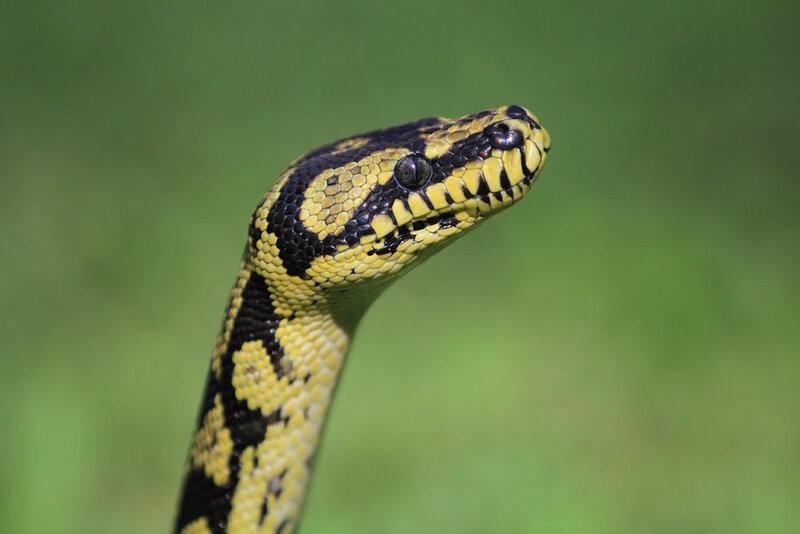 Those found in the desert are much duller with reds and browns, the jungle carpet python is vibrant yellow and black. Carpet pythons have special heat sensitive scales along their mouth (top and bottom jaws) called labial scales. They help to detect warm-blooded mammal prey. Other boas and pythons may have these scales, but not all do, and some only have it on one jaw. They are not as sensitive as the rattlesnake heat pit.